Jaguar put the new InControl Touch Pro system on its latest XJ model to the test in Mumbai by taking on the traditional acclaimed Dabbawalla delivery system in a race through the congested city streets. Dabbawallas are used by many Mumbai workers to take home cooked food to their places of work in small �tiffins� or �dabbas�. They operate on a complex relay system involving trains, buses, bikes and foot. 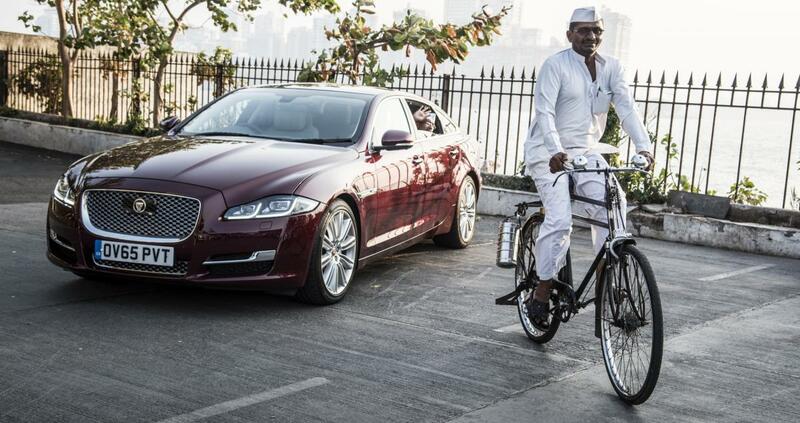 One Dabbawalla was given the chance to ride in luxury when the new Jaguar XJ picked him up, swapping a hard bike saddle for leather massage seats and the new InControl Touch Pro infotainment system in place of the noise of busy streets. The driver used the new navigation system to help steer through traffic as his rival Dabbawalla took the traditional route. Heavy traffic makes moving through the city a challenge, which is why the navigation system is of such benefit. But on a course designed to give close competition even with the road congestion, the dynamic pinch and zoom mapping allowed the XJ to reach its destination with time to spare. BY TRAIN . . .
Railbookers is an independent travel company, specializing in custom made rail vacations across the world. Established in 2003, Railbookers have offices in Los Angeles, London, Sydney and Auckland. We aim to deliver exceptional travel experiences by rail as we believe the journey is part of the holiday. For further information go to www.railbookers.com. United Airlines continues to uplift the in-flight experience, feeding customers' appetites for complimentary choices by offering free snacks in United Economy on thousands of daily flights within North America and Latin America beginning in February 2016. The free snacks come as United continues preparations to bring illycaffe's signature scuro dark roast coffee to United Club locations at the airline's mainland U.S. hubs beginning this month and to flights worldwide next summer. Customers on flights departing before 9:45 a.m. will receive a morning stroopwafel � a Dutch, caramel-filled waffle that pairs perfectly with coffee or tea, as shown on UnitedAirtime.com. Flights departing after 9:45 a.m. will offer packaged savory snacks, such as an Asian-style snack mix of rice crackers, sesame sticks and wasabi peas or a zesty-ranch mix of mini pretzel sticks, Cajun corn sticks and ranch soy nuts. Visit http://newsroom.united.com/foodandbeverages for photos of the complimentary snacks. "We're refocusing on the big and little things that we know matter to our customers and shape how they feel about their travel experience," said Jimmy Samartzis, United's vice president of food services and United Clubs. "We're bringing back complimentary snacks that are a nod to our global presence. They also add that extra level of service our employees will be proud to deliver and will make a big difference for our customers." Passengers will continue to enjoy United's Choice Menu items for purchase on flights that offer these options today. United joined with The Trotter Project this year, as the airline designed new chef-inspired, fresh Choice Menu options. Additionally, this month United expanded the availability of complimentary meals and free beer and wine to more Latin America flights, and in June, the airline significantly upgraded economy-cabin food and beverage service on long-haul international flights, with multi-course meals; complimentary beer, house wine and bottled water; and an option to purchase premium snacks. United Airlines and United Express operate an average of nearly 5,000 flights a day to 352 airports across six continents. In 2014, United and United Express operated nearly two million flights carrying 138 million customers. United is proud to have the world's most comprehensive route network, including U.S. mainland hubs in Chicago, Denver, Houston, Los Angeles, New York/Newark, San Francisco and Washington, D.C. United operates more than 700 mainline aircraft, and this year, the airline anticipates taking delivery of 34 new Boeing aircraft, including the 787-9 and the 737-900ER. United is also welcoming 49 new Embraer E175 aircraft to United Express. The airline is a founding member of Star Alliance, which provides service to 192 countries via 28 member airlines. Approximately 84,000 United employees reside in every U.S. state and in countries around the world. For more information, visit united.com, follow @United on Twitter or connect on Facebook. The common stock of United's parent, United Continental Holdings, Inc., is traded on the NYSE under the symbol UAL. BY SEA . . . . Question: Who is taking your tour on land? (4:50 a.m. EST) -- A cruise passenger was killed and three others injured when a tour bus crashed in Falmouth, Jamaica. The Independence of the Seas passengers were on the way back from a ship-organized excursion to Dunn's River Beach when the four-vehicle collision occurred. According to a local news report, the accident also involved a truck, a panel van and a car. Royal Caribbean Cruises Ltd. released the following statement: "On January 14, 21 Independence of the Seas' guests participating in the �Dolphin Swim and Dunn's River Falls' shore excursion in Falmouth, Jamaica, were involved in a traffic accident on their way back to the ship. We are saddened to report that one of our guests passed away. Three other guests were injured and are being treated at the local hospital. Crew members are at the hospital with our guests in order to help respond to this terrible incident. The other guests that were on the bus have been treated and released, and have continued on the ship." Independence of the Seas is sailing a five-night itinerary that departed Port Everglades, Florida, on Monday, January 11, with port calls to Labadee, Haiti and Falmouth, Jamaica.